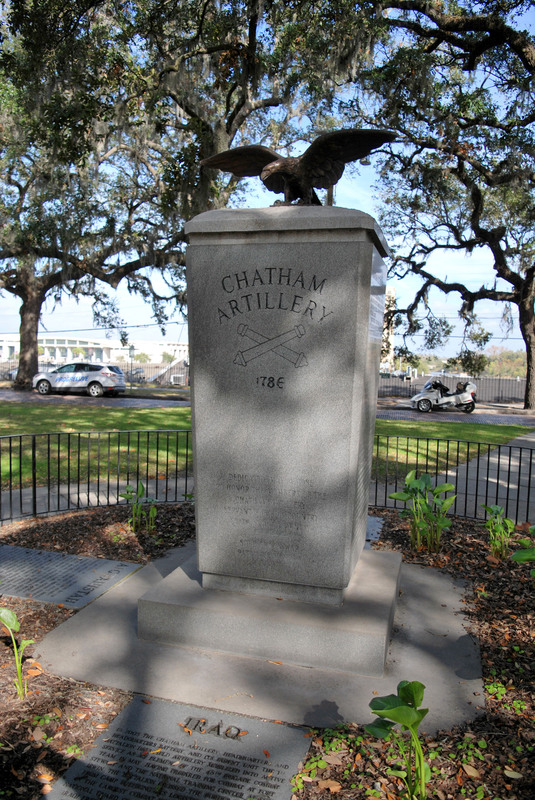 Description : This memorial was dedicated in May of 1986 to honor the members of the Chatham Artillery, a Savannah military unit formed in 1786. “June 1917 Federalized for WW1. Training at Fort McPherson and Camp Wheeler. As part of the (? )st Division In July 1918 Were Sent to Camp Jackson S.C. And Then To France For Combat Duty With the Allied Forces." Description : This memorial honors local marines who served from WWII to Beirut. 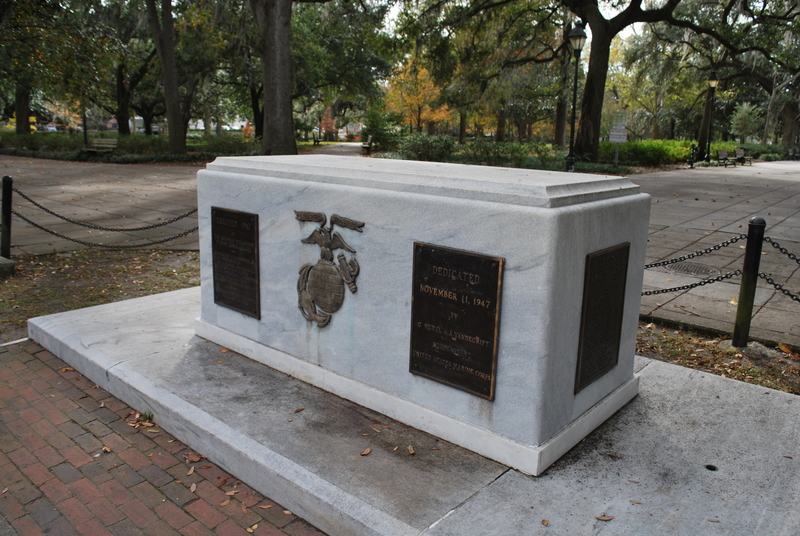 Initially dedicated November 11, 1947, by the Savannah Detachment - Marine Corps League. Chattooga County Memorial and Doughboy Statue. Inscription: In Memorium - World War Veterans of Chattooga County, Georgia 1917 - 1918. Erected 1934 by Citizens and Friends of Chattooga County. Fostered by The Trion Company, B.D. Riegel, Pres. & Treas., N.B. Murphy, Vice Pres., A.D. Elliott. 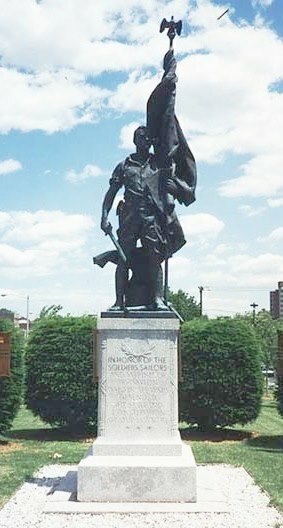 Spirit of The American Doughboy (statue), Copyrighted by E.M. Viquesney, Sculptor, Spencer, Indiana. Bronze plaques on three sides of the memorial column are inscribed with the names of soldiers from this county that fought in WW1. Photos of these names are attached in the photo gallery. Those that lost their lives are marked with stars next to their names. Accompanying the memorial is an artillery piece. It has been identified as a German 7.6 Minenwerfer (Trench Mortar) on a carriage probably made post war so it could be displayed as a memorial. In the trenches, it would usually be on a square brace pad. These types of mortars were not used after the war and so were scrapped or taken as a war trophy by the allies. 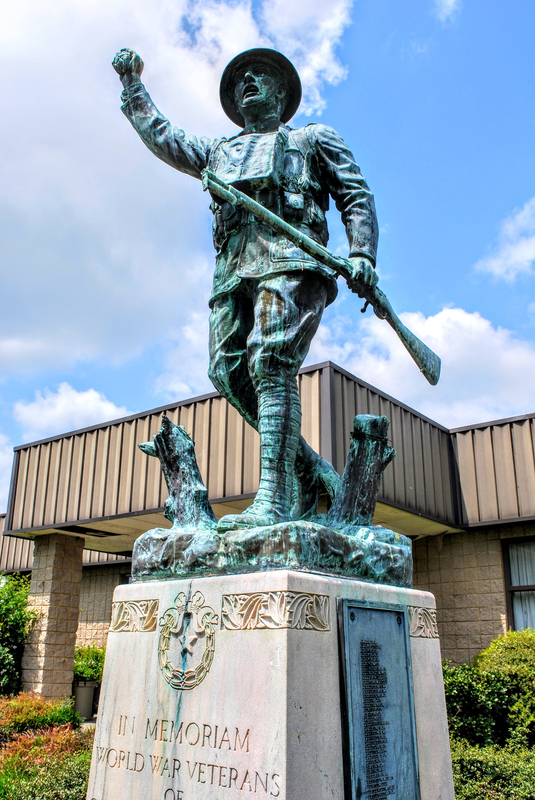 Description : The Chattooga County copy of the famous statue originally stood in Circle Park in Trion, but was moved to the VFW memorial home and rededicated in 1988. Address : 251 East Marietta St.
“Their Names May Be Forgotten But Their Deeds Are Recorded in the Annals of Their Grateful Country”. 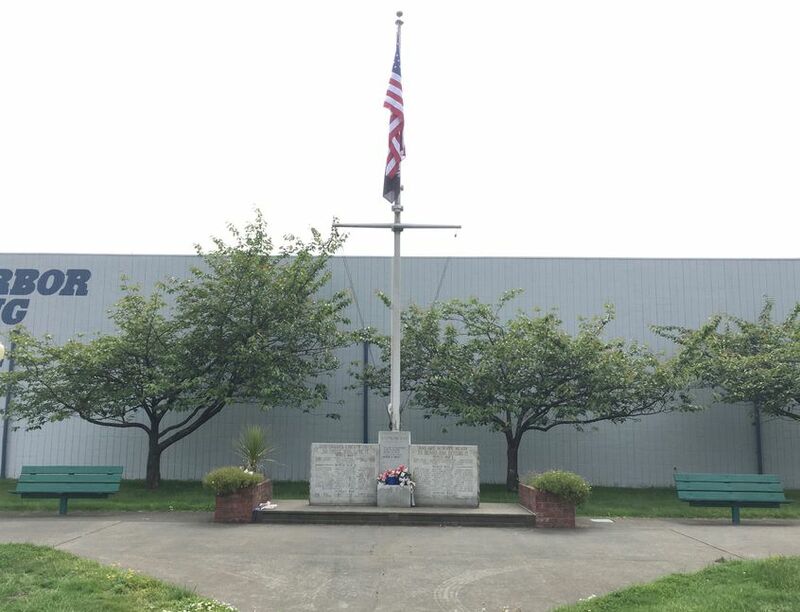 "IN HONOR OF THE MEN AND WOMEN OF THE TOWN OF CHESTER: WHO SERVED THEIR COUNTRY IN THE WORLD WAR"
Park contains a Memorial Monument to Hoquiam residents lost in World Wars 1, 2, Korea and Vietnam. association of Union Army veterans of the American Civil War. 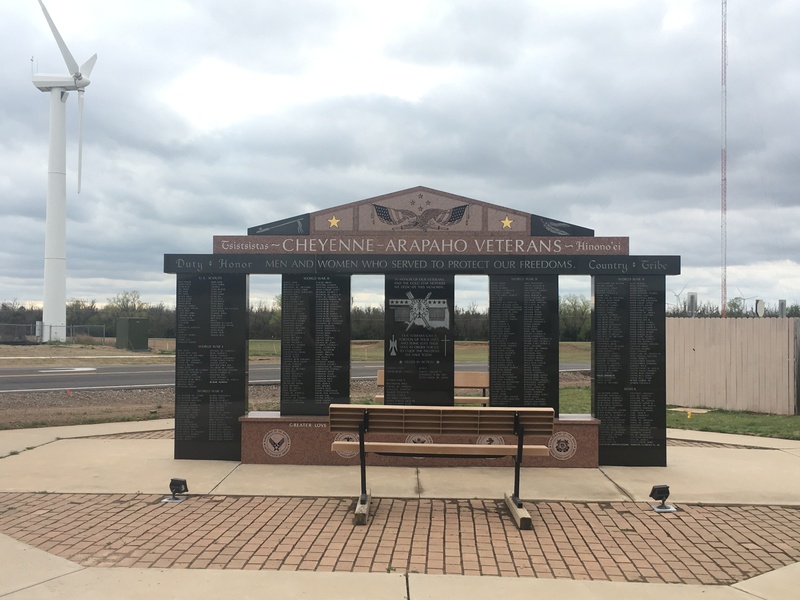 This war memorial stands on the grounds of the Cheyenne-Arapaho Tribal Headquarters. This is a beautiful war memorial, erected near the tribal administration offices. Four black granite pillars are engraved with the names of tribal members who have served in this Nation's wars. The photo gallery shows closeups of some of the names which are distinctly Native American. Above the four pillars a black granite cross beam reads: "Men and Women Who Served to Protect our Freedoms", and the words: Duty - Honor - Country - Tribe. A red granite gabled pediment is above engraved: "Cheyenne-Arapaho Veterans" and the words: Tsistsistas (Cheyenne) and Hinono'el (Arapaho). 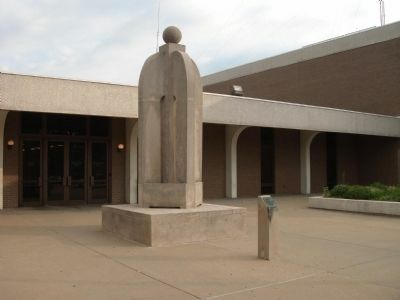 The center black pillar has a map of Oklahoma, with tribal symbols. It reads: "In honor of our veterans and the Gold Star Mothers we dedicate this memorial". Beneath that: "Our veterans gave a portion of their lives, and some lost their lives in order for us to enjoy the freedom we have now". 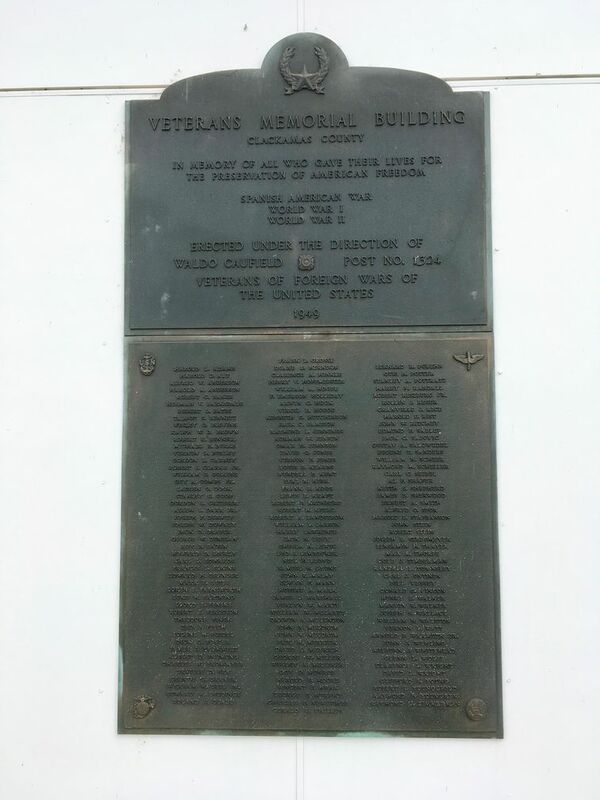 The names of those Killed In Action are listed beneath. The memorial stands on an octagonal plaza with two benches and is lit at night. Designed and built by Willis Granite. 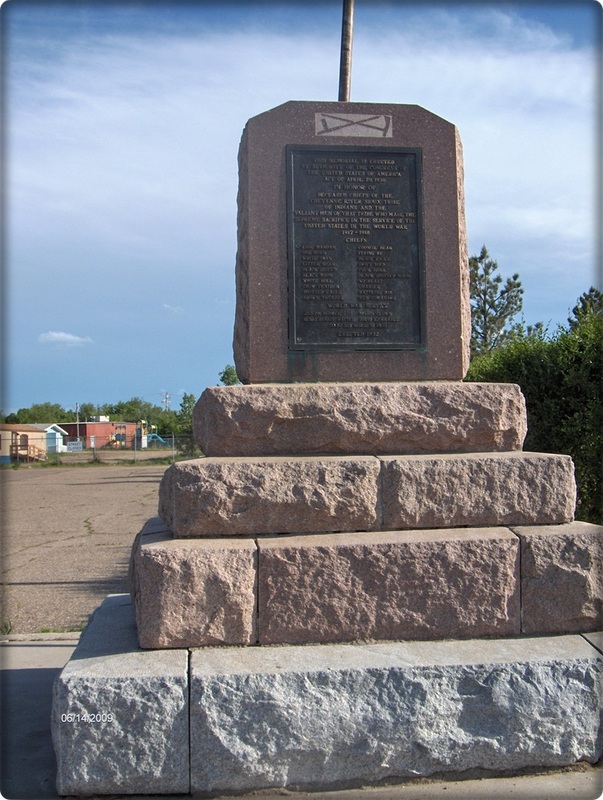 This memorial stone is located in the town of Eagle Butte, and honors the Sioux veterans, chiefs, and valiant men who died fighting in WWI. The impetus to erect this memorial came from Congress, in April 29, 1930, when they passed the resolution to build a memorial in order to honor the twenty-five Sioux men who fought in WWI. sources, as well as grants. 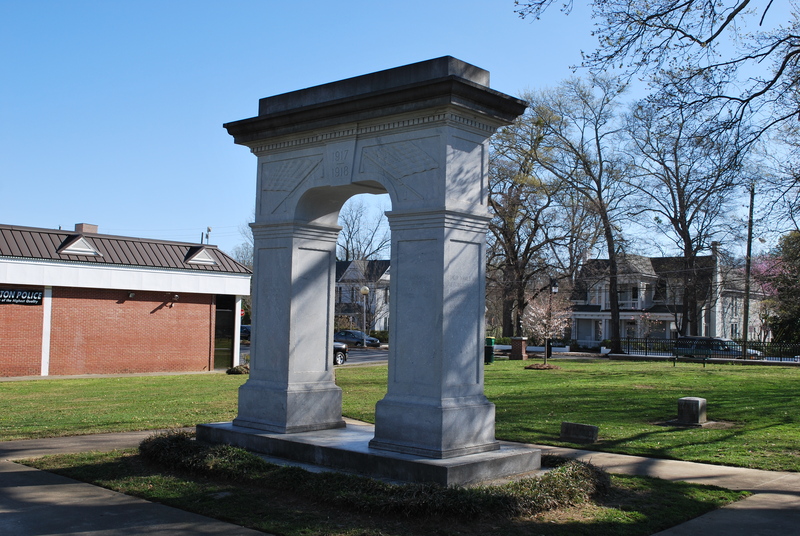 This memorial is inscribed: In Honor of Those Choctaws Who Gave Their Lives in Defense of Our Nation. It is further dedicated to the Choctaw code talkers of WW1. Although Native Americans were not considered citizens during WW1, roughly 10,000 volunteered to serve. Once they reached the front, Native servicemembers were stereotyped as fierce warriors and frequently assigned to dangerous missions. As a result, they suffered casualty rates five times higher than U.S. troops overall. Address : Kalivas Park, Lake, Cedar, Chestnut, and Barry Sts. A low relief bronze panel depicts a young man wearing a WWI military jacket, and that is set against an upright shaft of New Hampshire granite. At the top is a low relief image of an eagle, with wings spread fan-like upward, with a five-pointed star above its head. 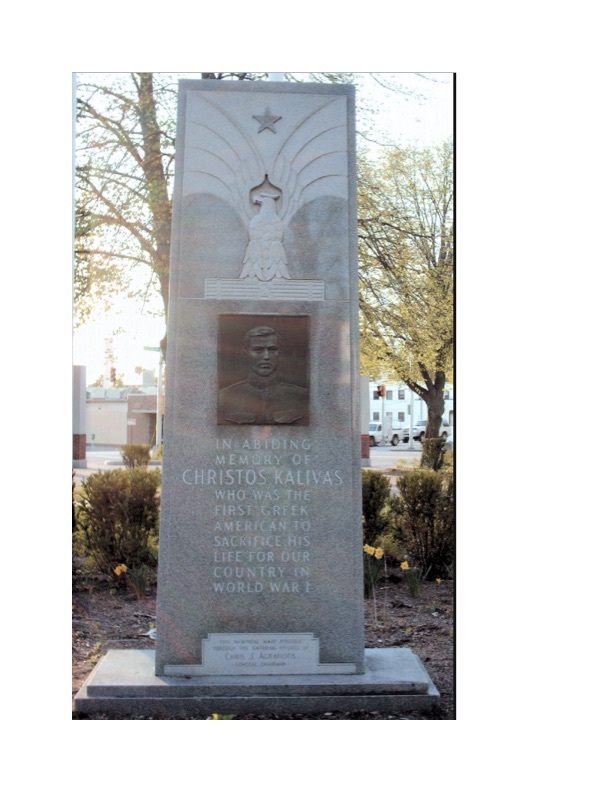 It was sculpted by Francoise T. Bourcier and dedicated on March 29, 1959, in memory of Christos Kalivas, the first Greek-American to die in WWI. 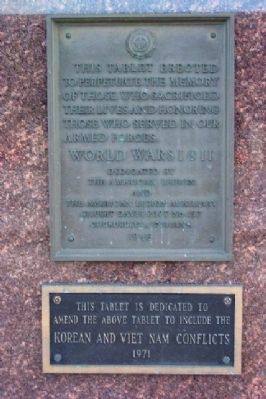 This tablet erected to perpetuate the memory of those who sacrificed their lives and honoring those who served in our armed forces. 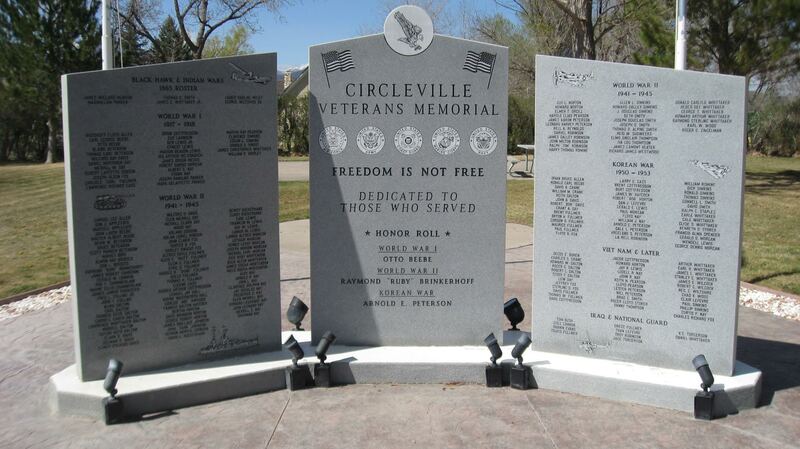 Donor bricks are located on each side of the walkway leading to the Circleville Veterans Memorial in the small park at approximately 115 E Main Street in Circleville, Utah. The memorial is dedicated to all those who have served, with sections for each war since 1865. A statue of a soldier, which can be seen in the picture gallery, stands near the memorial. 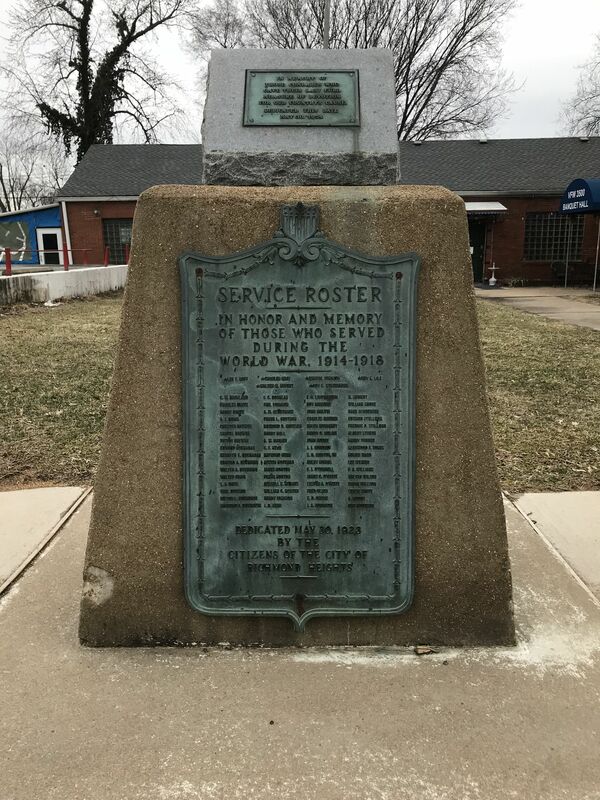 This monument was erected to honor the soldiers & sailors of Irvington, NJ who fought in World War I. It depicts a bronze soldier dressed in a military uniform with an open-collared shirt, holding a bayonet in his lowered right hand. In his left hand, he grasps an upright flagpole topped with a small eagle. A partially unfurled American flag wraps around the flagpole. In the back of the figure, an anvil is placed atop a tree stump and topped with an open book and an oil lamp. The statue stands on an inscribed marble base decorated in its upper portion with a relief of garland leaves. Narrative adapted from Smithsonian Institution Research Information System (SIRIS) inventory #NJ000277. 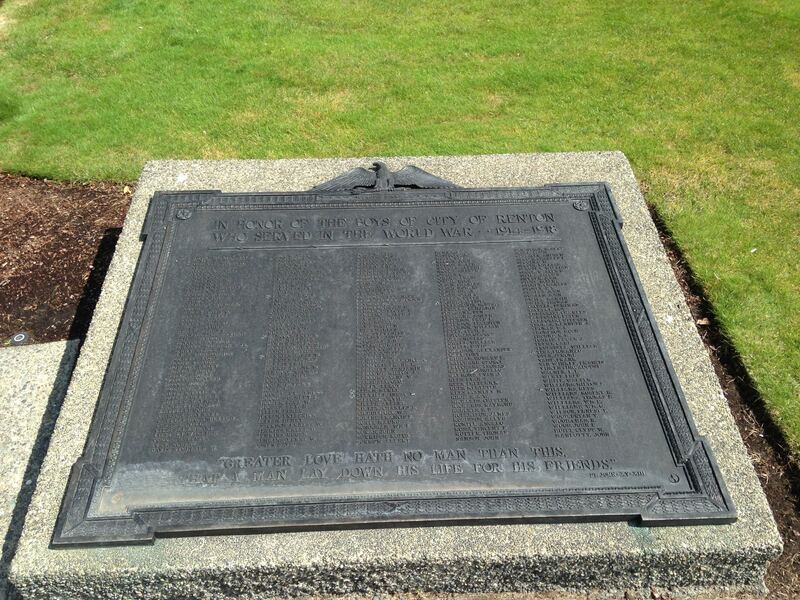 This plaque is inscribed with the names of "the boys of the city of Renton who served in the World War" as well as the Bible verse John 15:13: "Greater love hath no man than this, that a man lay down his life for his friends." A star next to a name signifies "Died In Service," meaning the servicemember was killed in action, died of wounds, died of disease, or died in an accident. 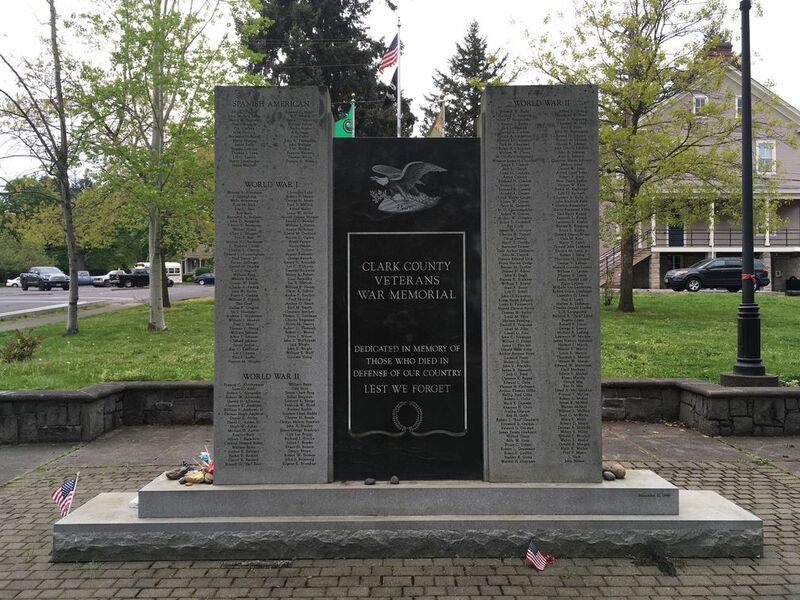 The memorial is located in Veterans Memorial Park, south of the Renton History Museum. the World War six of them who Died In Service are noted at the top of the list with a star preceding their name. 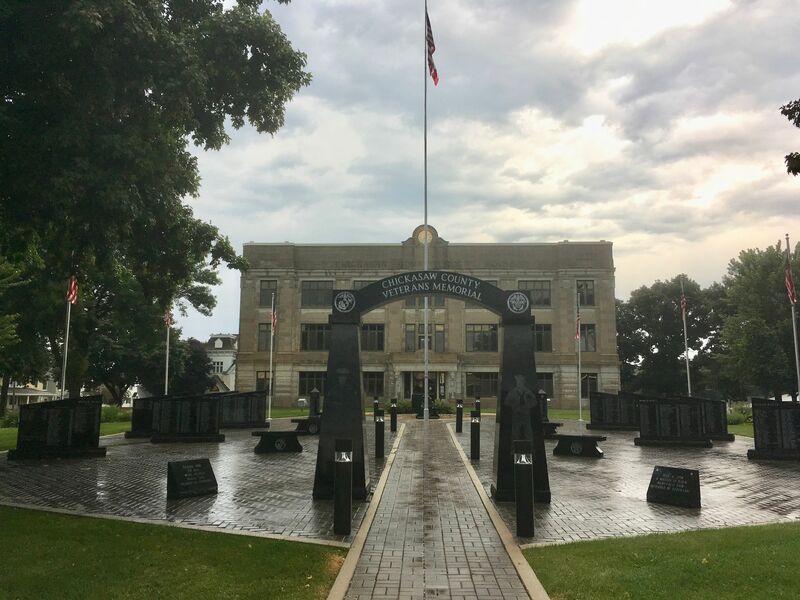 In recognition of those who served in World War 2 and The Korean War with special emphasis to those “…WHO GAVE THEIR LAST FULL MEASURE OF DEVOTION FOR THEIR COUNTY”, an additional plaque was added and dedicated on May 30, 1954. It however does not list the names of those soldiers, sailors, marines and airmen. 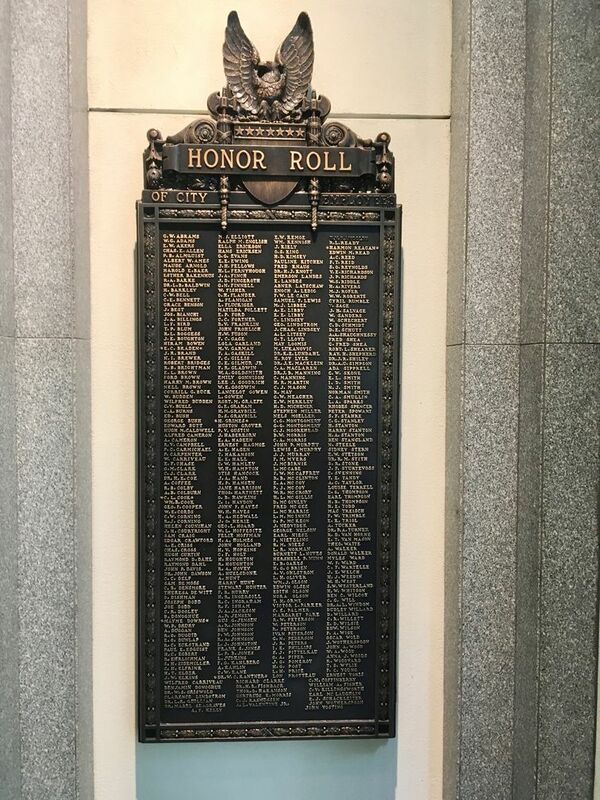 This bronze Honor Roll contains the names of all city employees who served in The World War. Names of service members lost in The Great War are precede by a Star. dedicated the Clackamas County Veterans Memorial Building, our Post home. Gladstone to Clackamas and Happy Valley, and of course Oregon City. by individual donations from within the community. 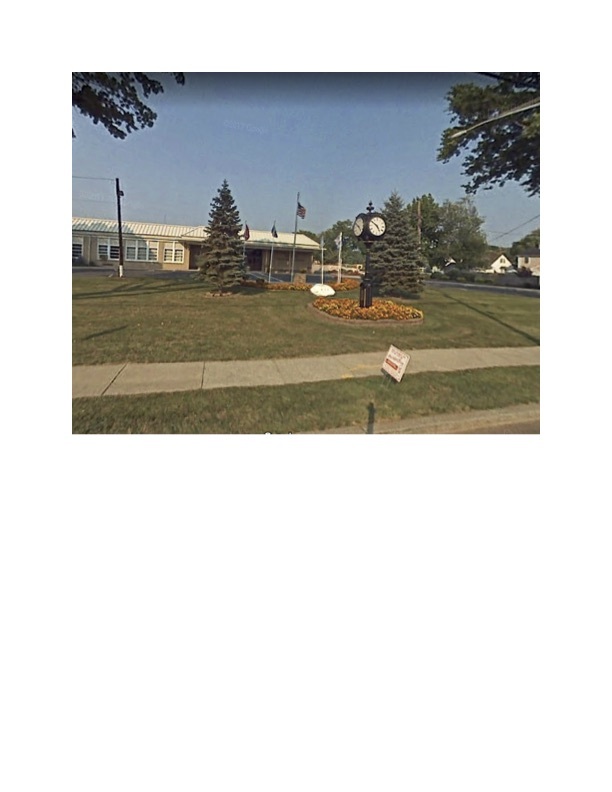 Address : Clark Municipal Building, 430 Westfield Ave. 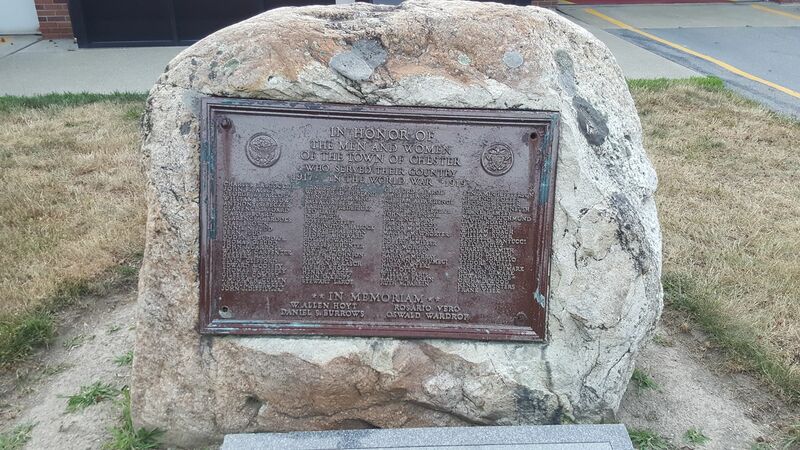 Attached to a stone marker is a bronze plaque dedicated to vet­erans. Beneath it is a marble inset engraved with the names of the wars - WWI, WWII, and the Korean, Vietnam, and Persian Gulf Wars.